Thousands of protesters, mostly women, and young families, turned out in Baltimore, Maryland, on a beautiful, sunny Saturday morning, January 20, 2018, to celebrate and demonstrate their collective power and renewed the fighting spirit. This was the first anniversary of their very successful efforts of a year ago to stand up to the newly-elected Republican President Donald Trump and his White House gang – and to the arch-conservative Republican agenda coming out of the U.S. Congress. Like last year, rallies and marches are being held across the country and in every major city. 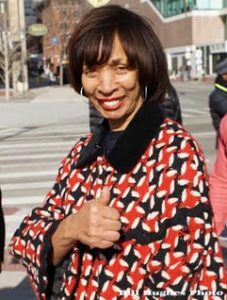 Baltimore’s Mayor Catherine Pugh was on hand, and spoke at today’s ceremony, as did many local and state elected officials. Today’s rally started around 11 am at the War Memorial Plaza in front of the City Hall. There was a long array of speakers at that site. Afterwards, the throng at City Hall marched in the thousands over to McKeldin Square, six blocks away, to the S/E corner of Light and Pratt Streets. The lively and spirited protest continued there on a more or less ad hoc basis. Women’s groups like Baltimore Rising, Baltimore Women United, Bmore Indivisible, CAIR, Emerge Maryland, NARAL, Inform Blue, the Baltimore Transgender Alliance, Together We Will, Moms Demand Action, and many others participated, along with individuals from Black Lives Matter, Resist, the #MeToo and #Trumpshutdown movements. AFSCMEMaryland underscored in its literature how the current Maryland governor, Republican Larry Hogan has a very bad track record “for women and working families.” They wrote that Hogan has “vetoed paid sick leave, tried to weaken unions… and has failed to support low-income workers.” Hogan is running for re-election this year. There is some irony in the fact that today’s “Power to the Polls” event occurred on the first day of a national government shutdown. No budget deal – no funding! It’s clear that a U.S. Congress and a White House controlled by Republicans, many of them card-carrying “Tea Baggers,” have let the American people down – badly. Mother Jones’s magazine claimed that the Women’s March of 2017, had never really ended. It insists it has the statistics to prove its point, too. Finally, today’s rally/march in Baltimore was very impressive, indeed, and further proof that the story of the Women’s Rally/March for Justice is still being written in this country. Stay tuned.